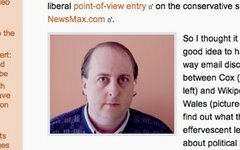 Additional evidence that pointing out manipulations, gross inconsistencies, and hypocrisy with Johnny Dollar, Robert Cox, and the rest of the insane asylum that is OlbermannWatch is like shooting fish in a barrel. Lesson #1: "There are two ways to smear someone. You can be covert: publish facts, but not the whole truth; let careful wording lead readers to the desired conclusion. Or you can be overt: a full-on personal attack, drenched in hyperbole, preferably culminating in high-decibel name-calling." As our favorite carnival barker spat out his traditional patter, he touched on all the proper spin points: the "escalation" (DNC spin-term for sending in reinforcements, with the added bonus that it has VietNam resonance), lawmakers opposing the surge, The Great Leak Case, Kerry bows out, Hillary, and--glory be!--Cruise News! The infamous, deplorable Keith Olbermann led off with "Mister" Bush and Capitol Hill Republicans: the honeymoon "could be over". Only one Republican supported the anti-surge resolution, and that Republican was rewarded with a lengthy clip. Was he the only one who spoke? Silly rabbit, of course not. All of the rest of the Republicans disagreed with him, but how many of them got clips from Edward R Olbermann? You guessed it: zero. The most biased hour in television news. Publish facts, but not the whole truth? Check. Let careful wording lead readers to the desired conclusion? Check. A full-on personal attack, drenched in hyperbole, preferably culminating in high-decibel name-calling? Check. Lesson #2: "One of the favorite tricks of propagandists involves cherry-picking. If you recall the old tale of the blind men and the elephant, it's along those same lines. Except that, unlike those blind men, the haters deliberately choose anecdotal snippets to wilfully [sic.] create a false impression." He called Olbermann a coward -- specifically a "[female part of the anatomy] who wouldn't walk across the street against the red light." He then said he was ready to fight him, saying: "I would make a pizza out of him." KO's hot flashes are never-ending sources for amusement, but we note all this here because it is yet another example of Krazy Keith rewriting history to make himself look good. Cherry picking? Check. Choosing anecdotal snippets to willfully create a false impression? Check. Lesson #3: "Running numbers can reveal patterns. But figures can lie..."
Is Keith Olbermann a misogynist? 4,083 answers have been submitted. Does running numbers reveal a pattern? Yes - about the OlbermannWatch readership. Do these figures lie? Yes. Lesson #4: "It isn't easy being a Fox hater." Case in Point: Based on my own personal experience, Fox makes it very, very easy to hate Fox.